Did anyone say clusters? 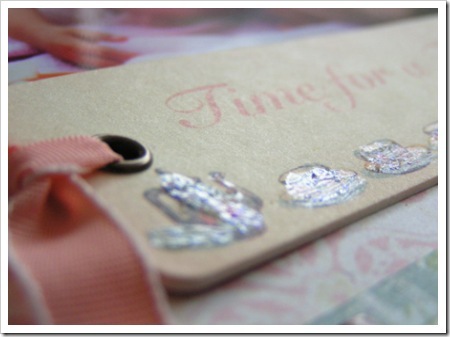 Jaimie’s favourites from the Tiffany range would have to be the chipboard tags, words, grommets and brads. 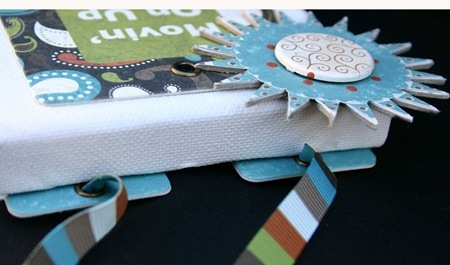 So much layering goodness and the words and tags make a perfect accompaniment and lead in to journaling. The Tiffany range is gorgeous!! 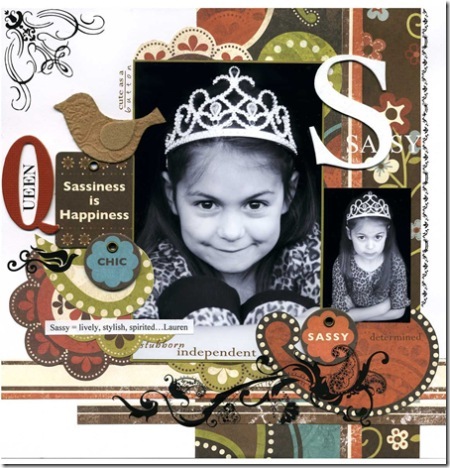 and perfect for all those princess pages. Jaimie decided to create a LO on the biggest princess in her family - her very spoilt puppy. 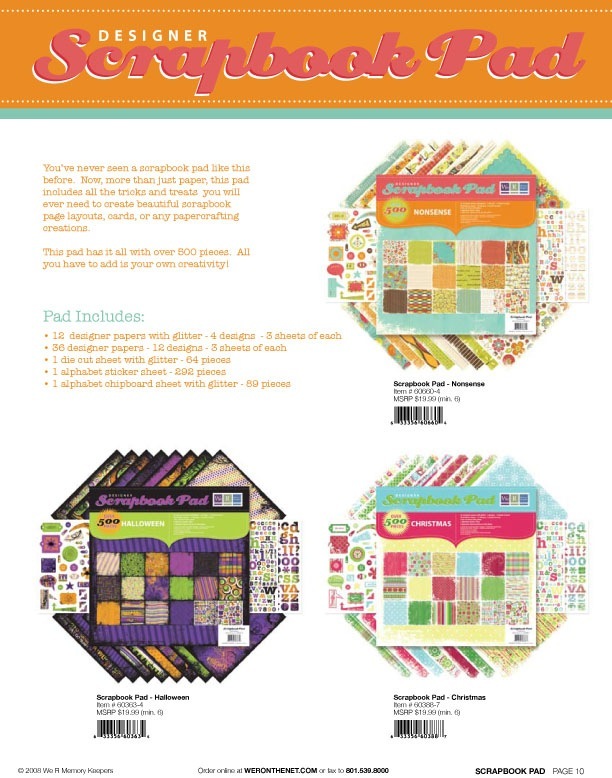 Lots of cut outs available in the patterned paper from the Tiffany 12x12 scrappad are perfect for clustering and layers and the colour choice is too die for!!. 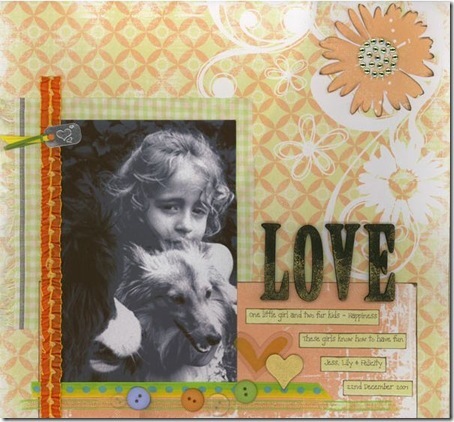 This very simple and sweet page is finished off with a cute take on journaling where Jaimie has told the story of her spoilt puppy in the form of a 'once upon a time' story. Beautiful. 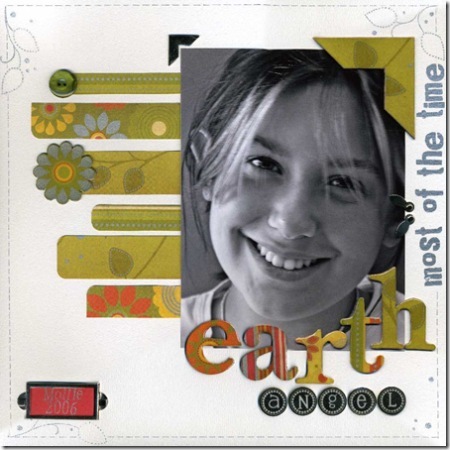 Jaimie picked up this clock with the idea to alter it - after pulling it gently apart she created the centre piece by cutting out a circle to fit and then cut and layered patterns from the WeR Tiffany scrappad until she was happy with the result. Jaimie then adhered paper to the outside of the clock and with the addition of a cherryArte rubon and BG numbers this very quick project was finished in no time. 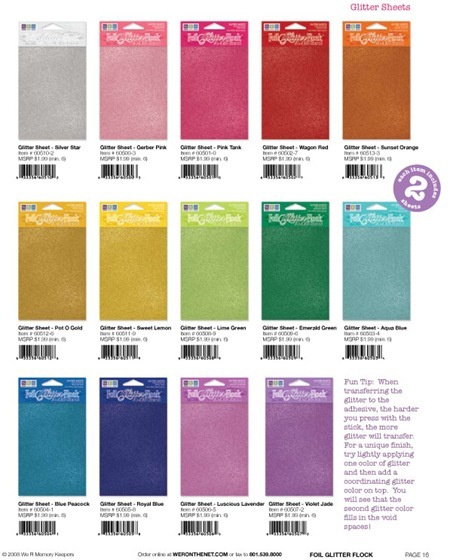 Jaimie has found it very easy to come up with different projects as the WeR Tiffany range is so versatile. 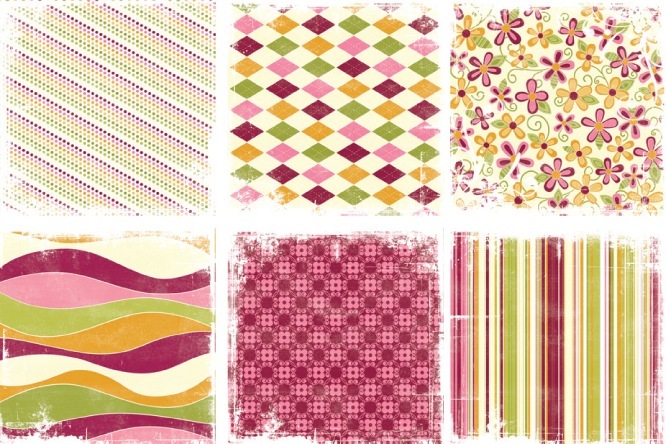 Lots of patterns to cut out and layer and beautiful solids in a spectacular palette make for easy coordination. Jaimie created a note board for her daughter. 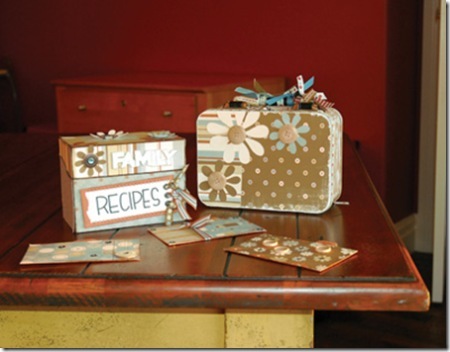 Using one of the many solid papers in the scrappad as her base she then added coordinating patterned papers, tags, letters, brads and grommets before adding a cute notepad she picked up from a local shop. To finish off and give a sturdy base for the note board, Jaimie backed the project with heavy cardboard and added velcro dots so it can hang near her daughters desk. 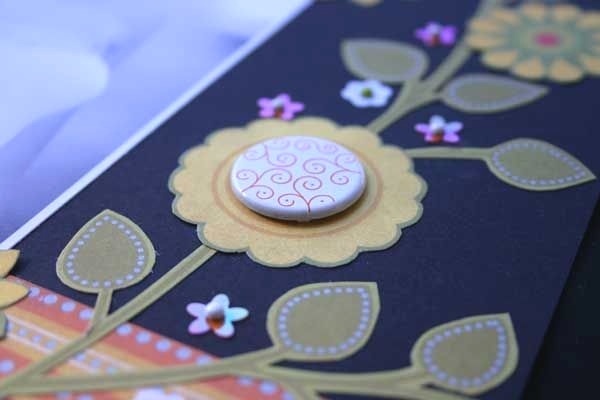 Chris used 2 die cut cardstocks on this layout and instead of using them as a whole piece she had cut the flower die cut and place it to the side of the layout giving it the appearance of actually being part of the backing cardstock. 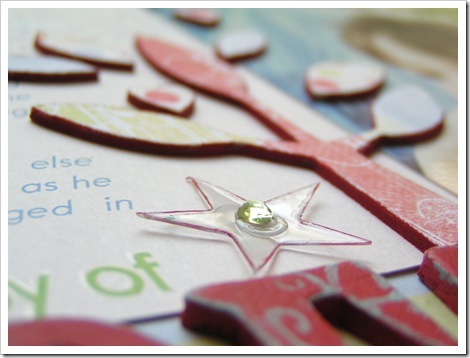 She has then cut the bracket die cut piece using the top and bottom part of the cardstock on top of each other inking the top piece to show the layering. 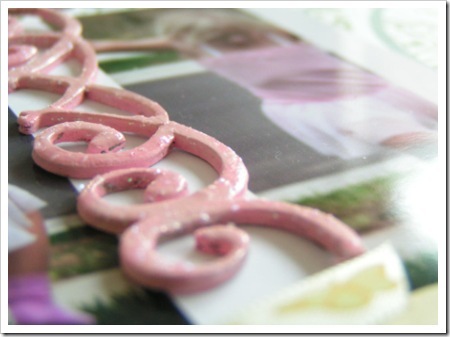 Chris used the flocked lace under a piece of pattern paper to create a decorative trim. 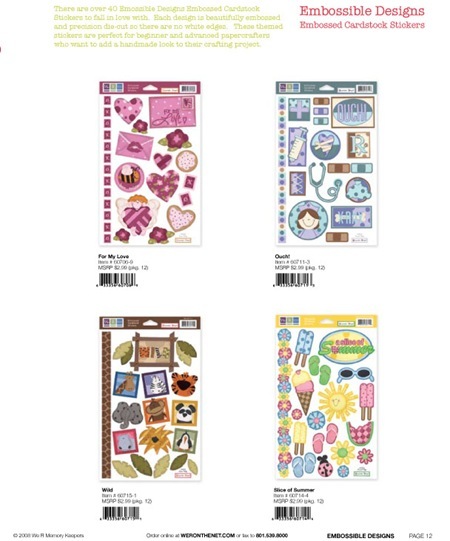 We-R-Memory Keepers Tiffany pattern papers and embellishments are just beautiful, Carole loved the vibrant colours, and the gorgeous stickers to this collection. 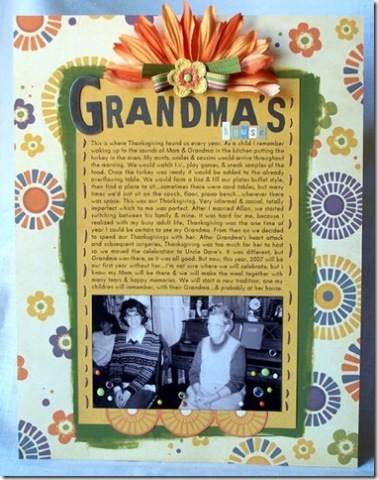 Carole created borders with the stickers and ribbon, and then layered the papers and stickers to create cute little embellishments. 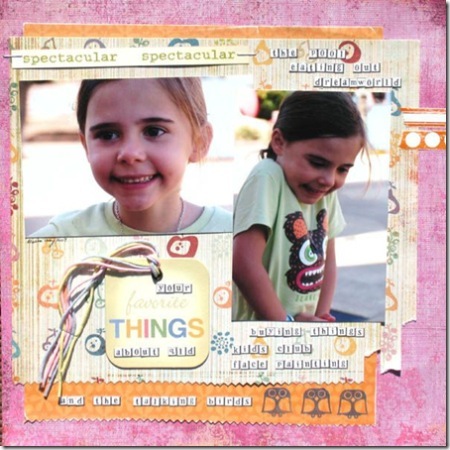 Just like this adorable mini album, Gabriella Beck was tickled pink when I asked if she'd share this fabulous creation with us on the blog. 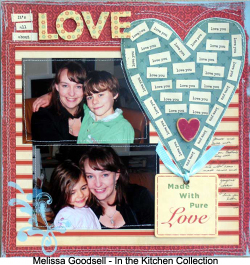 Gabriella used the lovely Heart Attack range to transform this Basic Grey chipboard album into a mini master piece!! Many thanks Gabriella for sharing! 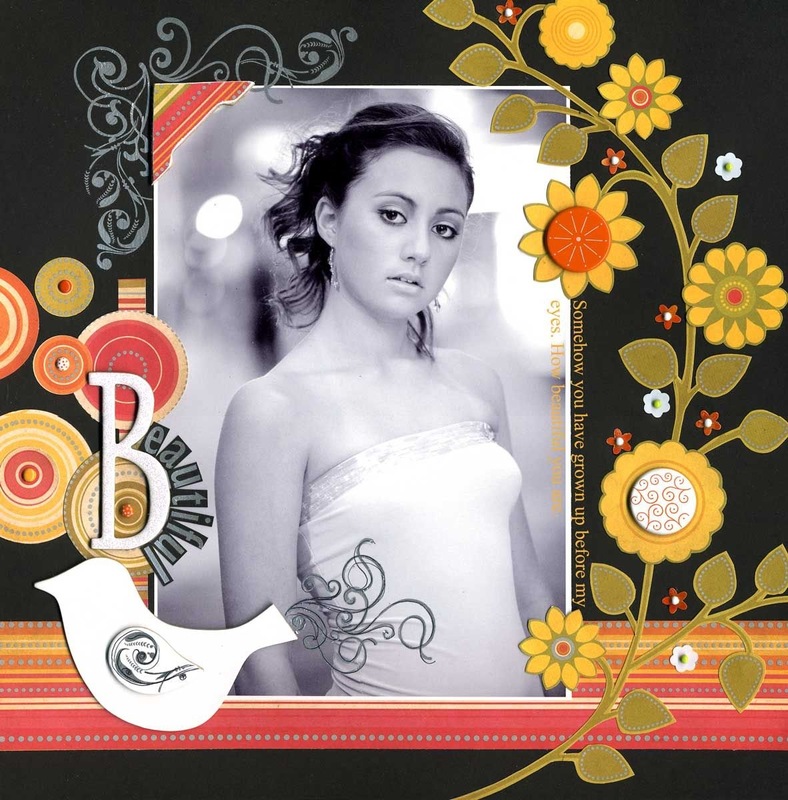 Tracey Spencer from Ontario Canada has created this gorgeous page. She says: "To complete this LO I used 2 punches. 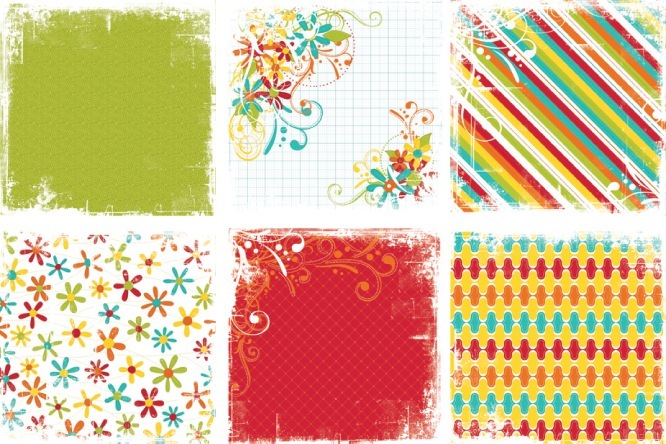 First I punched out various squares from the different patterned papers. Then I used a heart punch and cut out hearts from the center of each square. I continued by mixing up all the hearts, inking them and replacing them back into different squares. 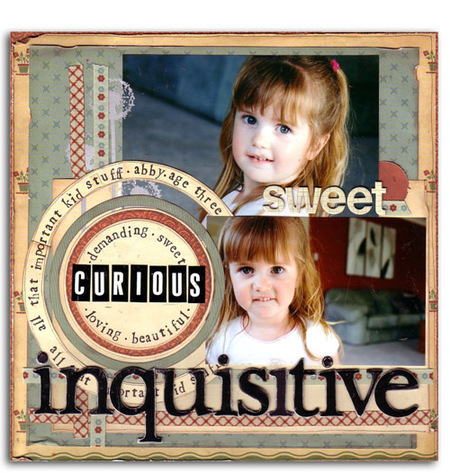 I arranged them around this sweet photo of my niece, added some scalloped borders. layered on some chipboard hearts and called it done. 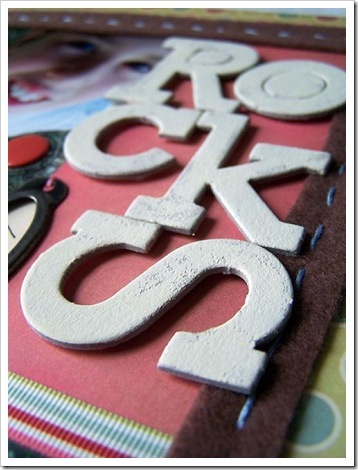 :D The I *Heart* U chipboard made a perfect title." Thanks Tracey, this LO is beautiful. 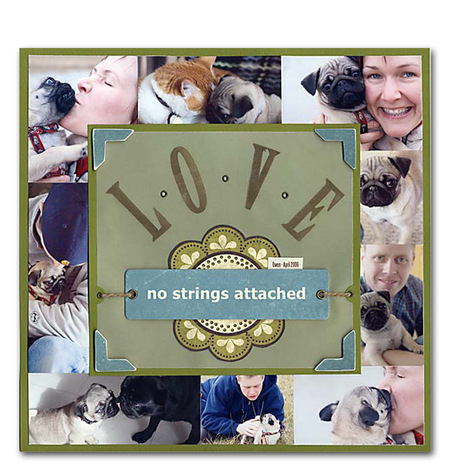 Using the Heart Attack range also is Kim Arnold who shares this delightful layout with us! 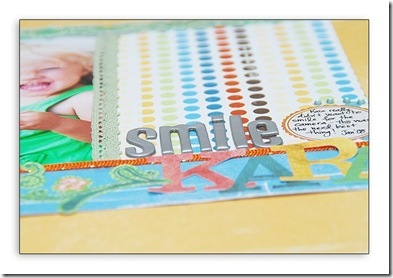 We love how Kim has distressed the edges of the paper, it's the perfect weight paper to do this with. Thanks Kim for sharing with us! The lovely Mel Nunn has created this masterpiece to remember the closeness of her children. 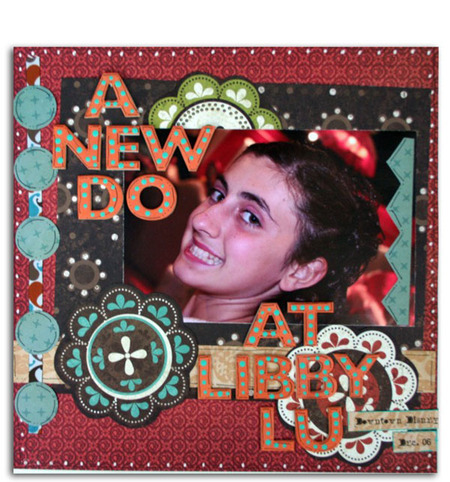 We loved the way Mel framed her photo with paper, rubons and clustered embellishments. Divine Mel and thanks for letting us show it off. 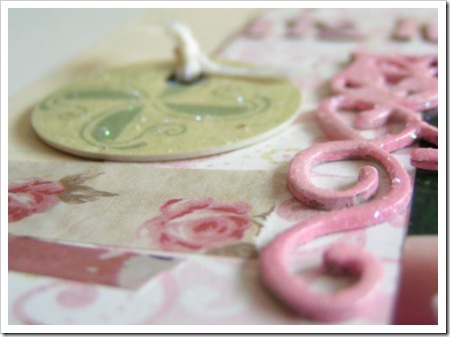 Finally, Chris used her left over paper to create this pretty and quick card for a friend. 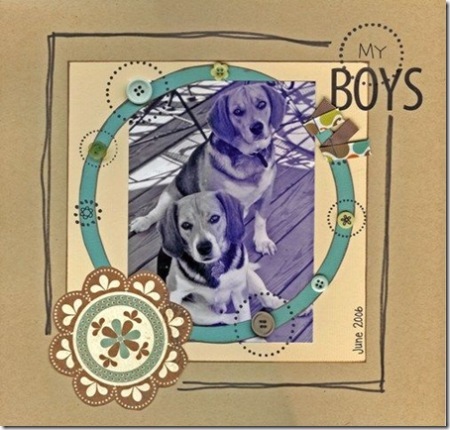 Its always great to create a Boy Layout, and to use the We R Memory Keepers Pewter Press Pattern Papers worked really well for Carole. To give the layout more of a Boyish feel, Carole distressed the papers, and also a little crunching and did plenty of stitching and also used buttons to get the result she was looking for. The beautiful contrasting colour palette of the We R Memory Keepers Silver Lining range was perfect to showcase this gorgeous photo of Nicole's daughter Madeleine and her little friend Phoebe. Nic added definition between the elements by distressing all of the paper edges with sanding and tearing and then added a few simple embellishments, also continuing the white highlights with a little handstitching. She also added some Heidi Swapp silver chipboard and Pink Paislee Pop Fashion silver rub-ons which were an exact match to the gorgeous silver foiled paper. Nic loves the pewter look of the silver, and it's ease of application with a bright layout like this one, yet is equally at home with something more vintage-inspired. Carrying on the 'inchie' theme from a few posts ago, Suz has used We R Memory Keepers 'On the Dot' range of patterned papers to create this layout about a recent weekend away. The subtle earthy tones worked beautifully with the main photo as well as the outdoors shots. 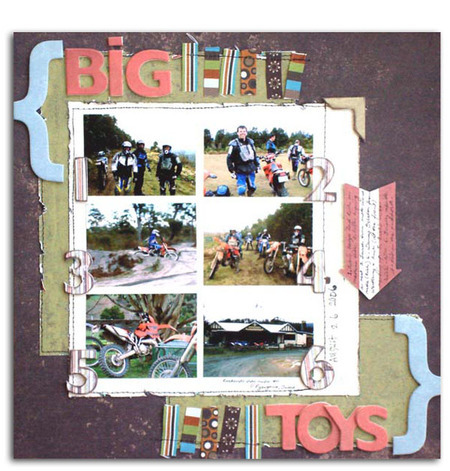 Suz has combined the papers with one of the We R Memory Keepers Designer Snaps, White Out Promenade rubons and of course, a touch of Hambly woodgrain! 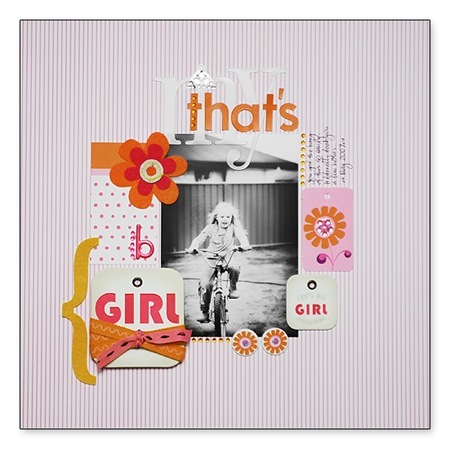 Mel created this fun and girly layout using the Hoopla collection with a few little elements also thrown in there from the Frenzy range, showing how easy it is to mix and match. 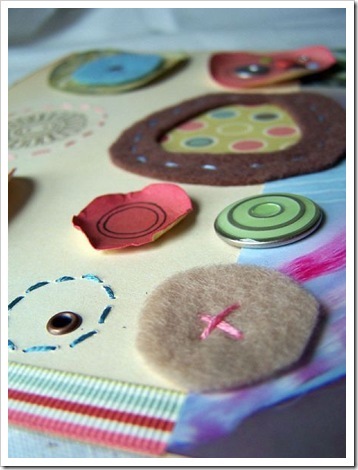 The circles were hand cut and handstitched into position (Hoopla Whoopee patterned paper). 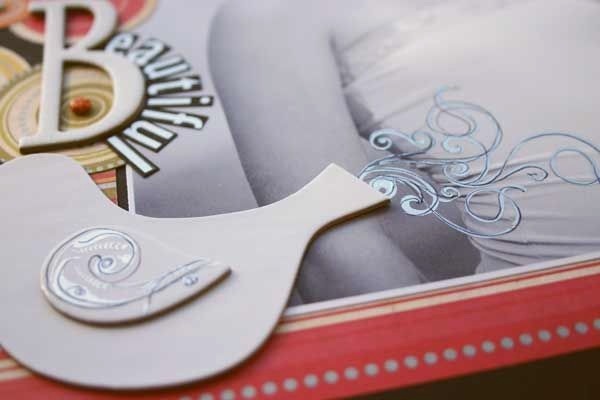 The middle swirl running through the page was also handcut from patterned paper (Hoopla Cheer) and lifted up from the layout using 3d foam squares. The Frenzy range is bright, cheerful and very fun. 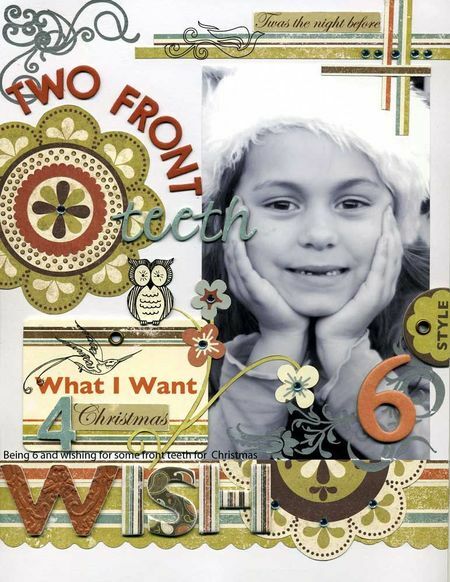 Mel has mixed up a few of the patterned papers from the range and combined them with a little Frenzy layered chipboard accent to create a layout about the sock monkey she made with her daughter Bella. 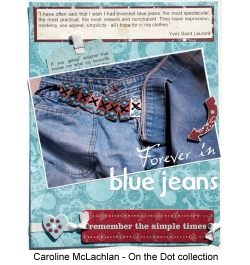 Notice the journaling on the right hand side (Carolee's Creations Tiny Whoopsy Alphas) - an easy and different way to tell a story. Create a couple of quick cards with your leftover bits and pieces as Mel has done here. 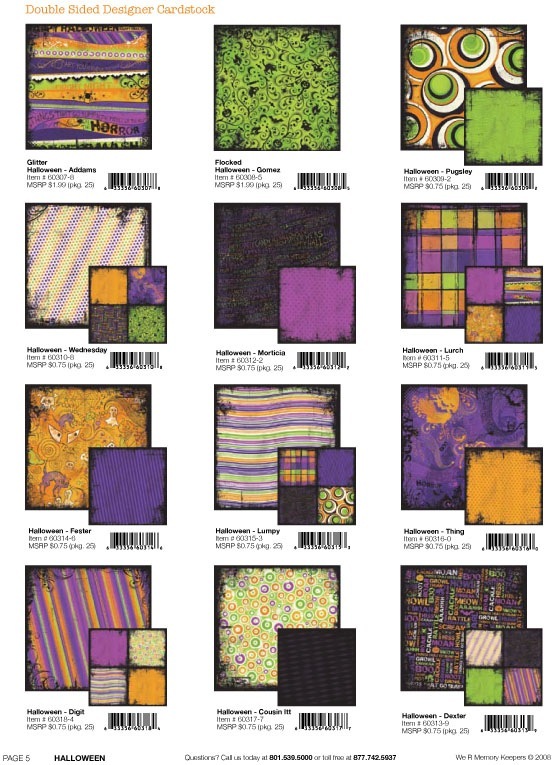 They're great to have on hand for a surprise occasion and look lovely and bright when put together with the Hoopla or Frenzy collection. Foil Glitter Flock rub-ons from We R Memory Keepers gives you so much more than your typical rub-ons, they allow you to customize them using the sheets of foil, glitter or flock supplied in the kit. Just cut out your choice of adhesive rub-on and apply it to your project like usual using the included craft stick. 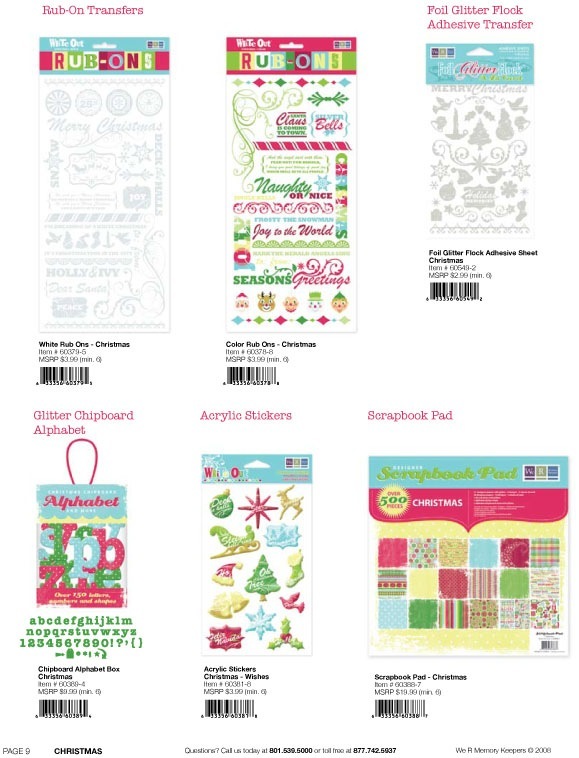 After that, place one of the foil, glitter or flocking sheets on top and apply pressure with the craft stick to transfer the material to the adhesive pattern you already rubbed on. 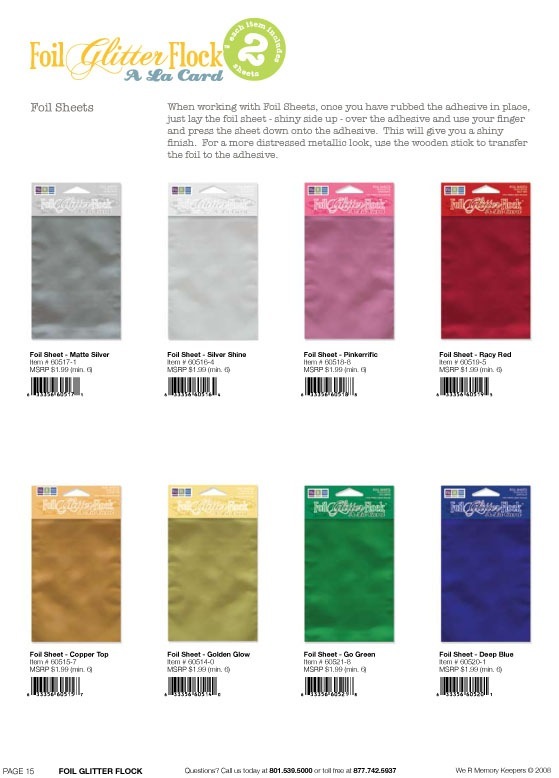 Peel off the sheet to reveal a rub-on you customized yourself! 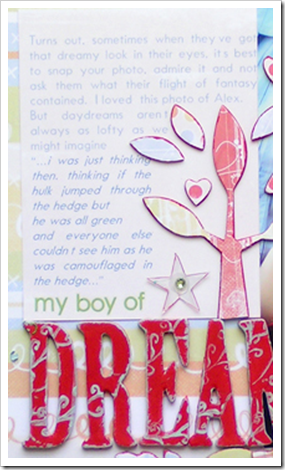 Caz has used the Thank You kit rub-ons and the White out Range of papers to create these funky cards. She found the rub-ons really easy and fun to work with. 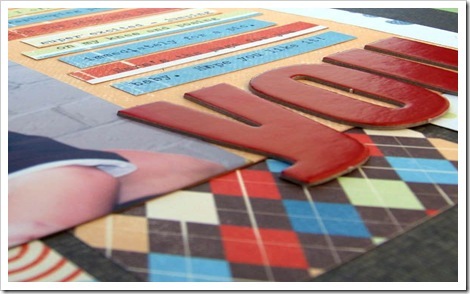 She created the multi-colour designs by cutting out and rubbing on the different areas of the design one at a time. 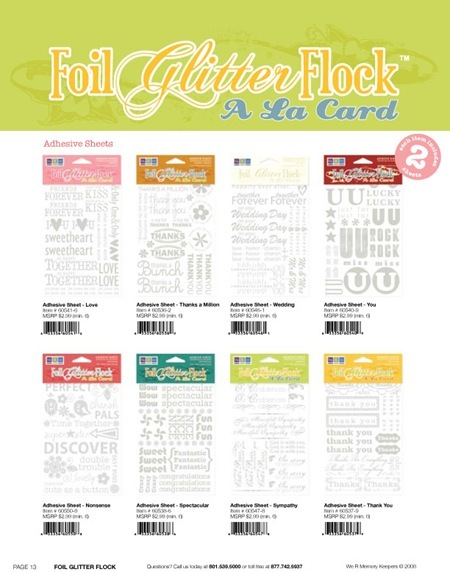 The flock and glitter needs to be rubbed on quite firmly with the stick provided but the foil needs only be pressed gently with your fingers. 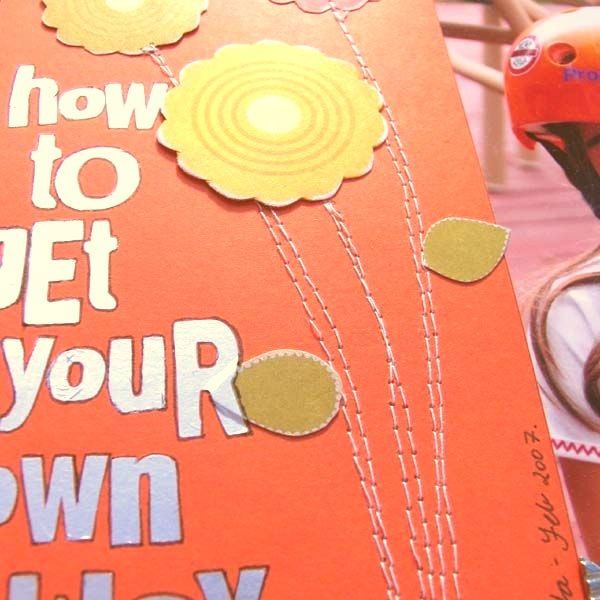 You can also create lines with double sided tape and rub the foil, glitter or flock onto them as Caz has done around the word "Thanks" in the foil decorated card. 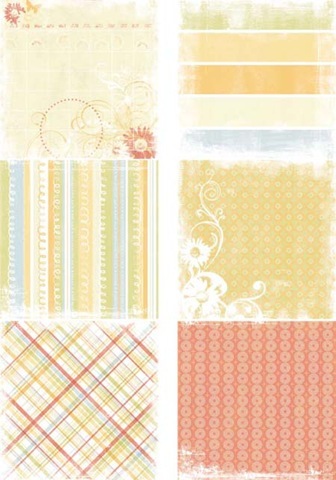 We loved this innovative layout by Kathie Link, creating a chequerboard effect with We R Memory Keepers White Out 'Frenzy' range of patterned papers. She has used tiny photographs of her son on a slide, and even used some of the blank squares for journalling. We love it - thanks Kathie! 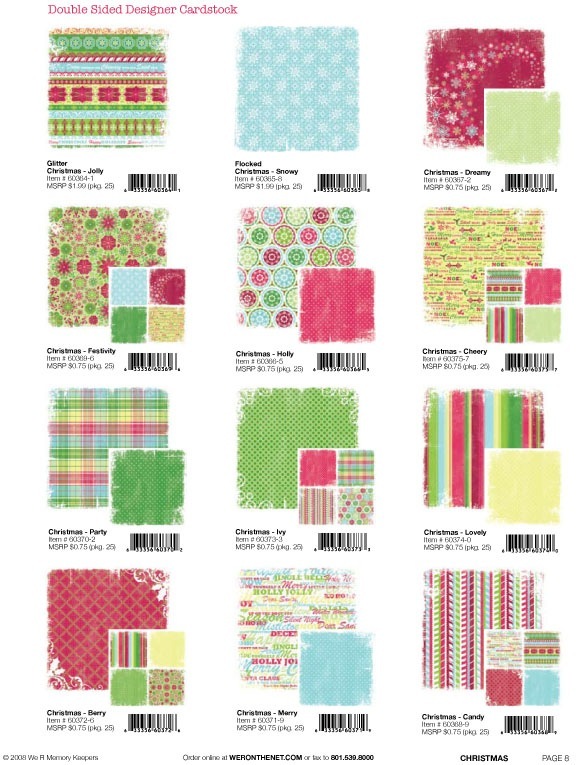 We thank Cindy Tobey for this inspiring layout also using lots of small photos and the older but still fabulous Summertime range of patterned papers. 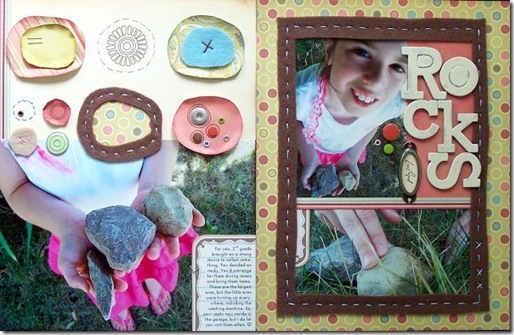 We loved the balance despite the assymetry of the page that Cindy managed to achieve. 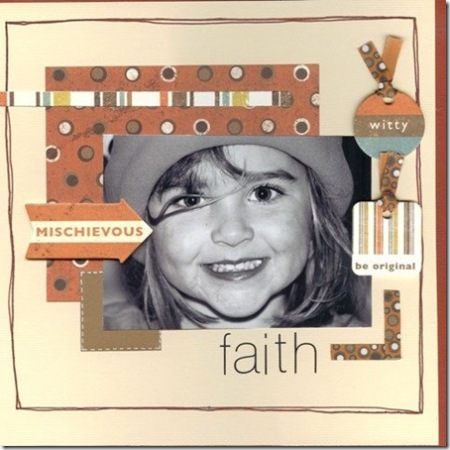 Thankyou to Sheree Forcier for sharing this really cool layout using the Frenzy collection. We loved Sheree's little finishing touches such as the hand and machine stitching in funky bright colours to match the layout. Sheree also created this stunning gift bag and card using the Frenzy range for a friend's birthday, again adding small touches (hand stitching) to make this a really special keepsake. we r memory keepers never disappoints, and we love the look of their latest addition to the white out range, nonsense. 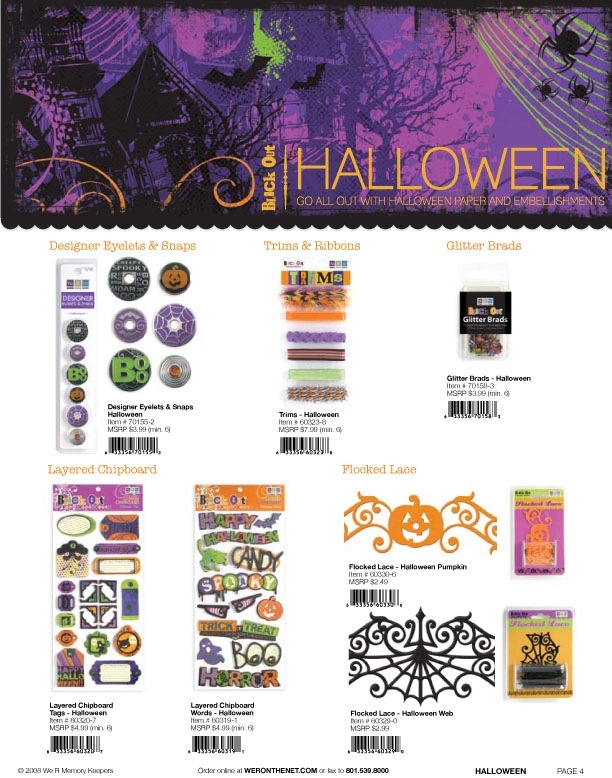 they're also covering halloween and christmas, and there's been some exciting new developments in their foil flock glitter products. also features the 'big bite' - just in case you haven't seen it yet! Donna spent an entire week trying to get her gorgeous niece to smile for the camera. This mightn't be exactly what she had in mind, but it certainly demonstrates this little-one's larger-than-life personality. 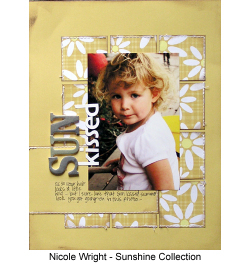 The lovely colours and texture of We R Memory Keeper's Explore range of papers highlights this sweet photo and this little girl's bubbly nature. For this layout Mel has used four thick strips of varying patterned papers from the White Out collection (explore) to create a background for her photos and journaling. The colour combinations in the range are lovely and earthy - perfect for those boyish photos in your stash just begging to be scrapped. The We R Memory Keepers White Out 'Promenade' line is quite predictably one of Suz's current favourites - all that white combined with vibrant yet light colours. The Li'l Davis spotted alphas work with the paper just perfectly perfectly and Suz has doodled around the edges of both those and the papers to give the layout a slight light cartoon-ey look. 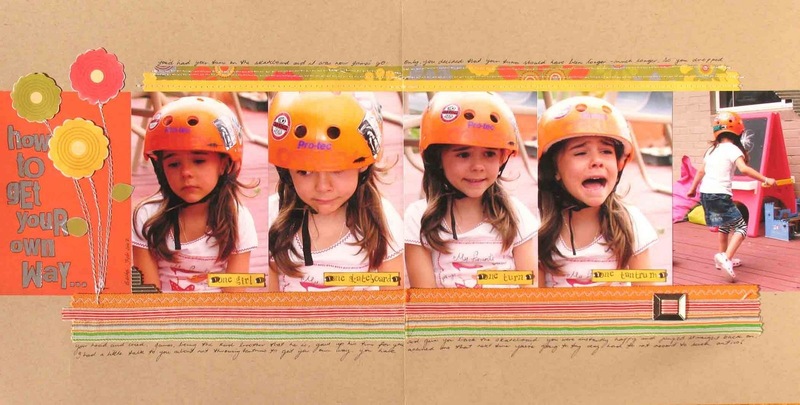 These papers perfectly complemented these photos of her son Alex. Obviously the photos were taken at the same time but she has used different ones to highlight different aspects of the event at which they were taken. This one deals specifically with a dreamy look that turns out to be not so dreamy. 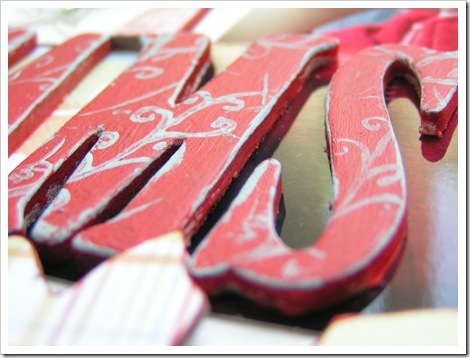 Suz has painted and stamped a Carolee's Creations foam alphabet here to co-ordinate with the reds in the We R papers, and the chipboard is all from the BasicGrey Mellow chip packet. 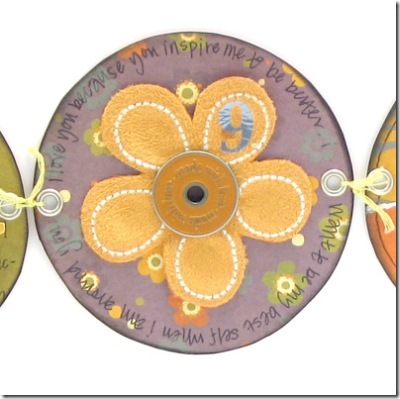 We thank Anabelle O'Malley for allowing us to share this plaque that she has created, again using the Promenade range. Such a gorgeous photograph and simple but effective4 layering of the papers and chipboard elements. We would also like to thank Tracy Wyldman for sharing with us her scrumptious 'love' layout featuring her fury friends and daughter Felicity. 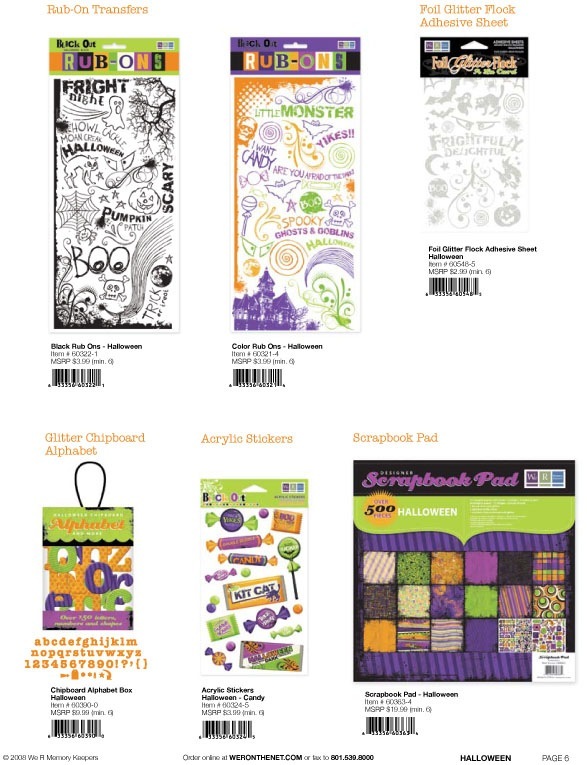 The black and white photo looks gorgeous as a contrast with the patterned papers from the White Out Collection. 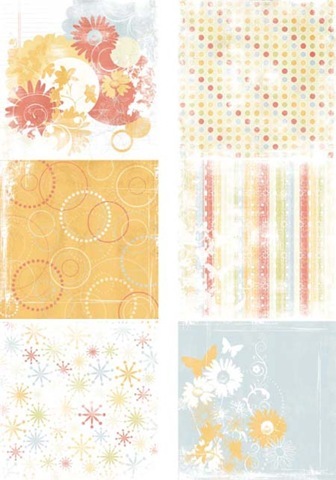 Jo Kneller created this breathtaking layout using the Promenade patterned papers from the White Out Collection. We loved the gorgeous hand crafted Jenni Bowlin butterfly, the handstitching and also how Jo inked the papers to give a beautiful sunkissed appearance. 'Rocks' also by Cindy Tobey, first grabbed our attention due to the interesting subject matter. 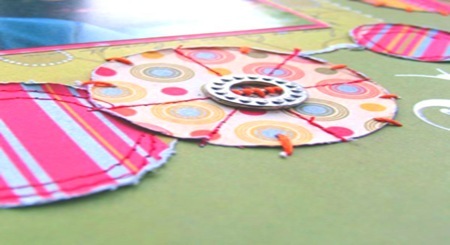 Cindy's use of patterned paper and WRMK snaps and eyelets to create simple, but eye-catching embellishments for her page is simply inspired. We love the photos and we love the whole concept. Beautiful work, Cindy! 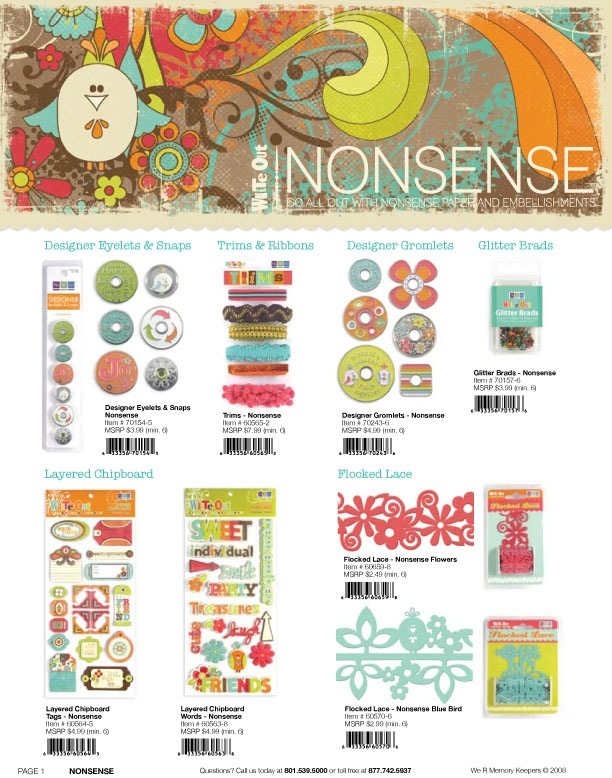 Cindy Tobey has for us, not one, but two layouts this month. 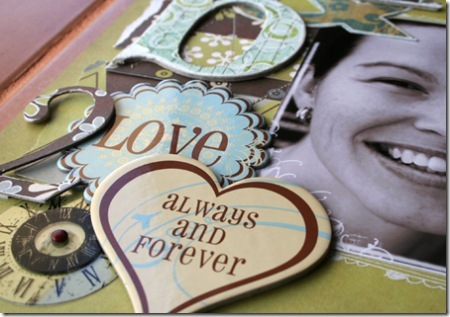 Her use of of We Are Memory Keepers products demonstrate both WRMK's and her own, versatility. 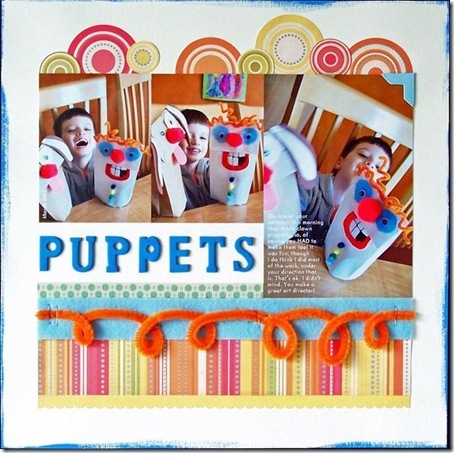 We loved the bright colours of this ('Puppets') layout and her inclusion of some funky pipe cleaners. 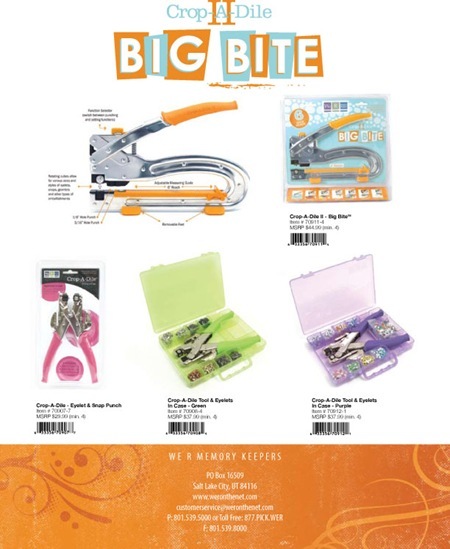 the big news from we r memory keepers is the new BIG BITE crop-a-dile. 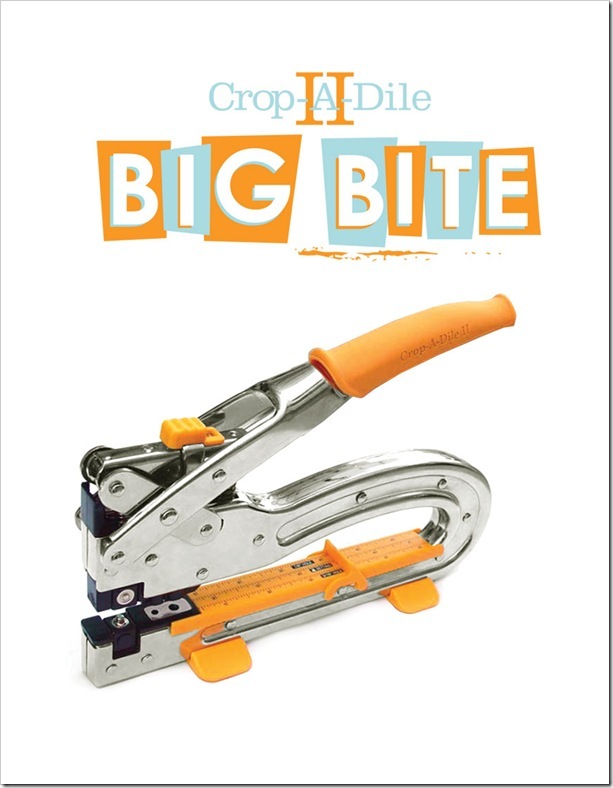 we talked, they listened and the new crop-a-dile has a 6" reach which means it can hole punch and eyelet, snap or grommet set anywhere on your page. 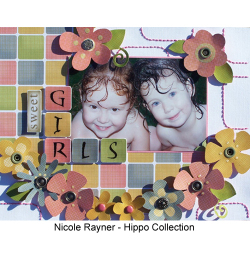 The Hippo Tag-Line tags work perfectly with the Basic Grey Recess range of papers, which Mel discovered here with her layout. 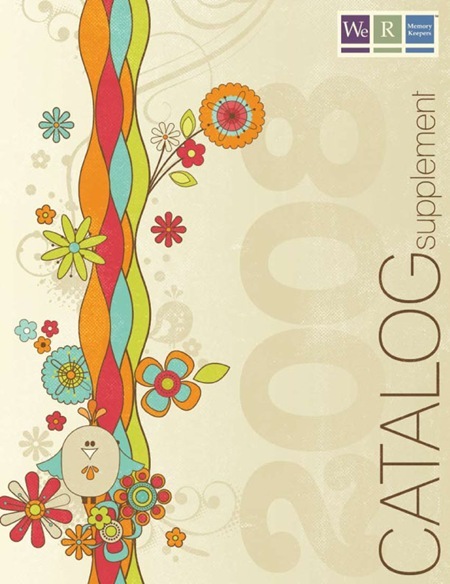 The flowers were handcut from Hippo Flowers patterned paper and then scattered across the layout, combined with a splash of buttons and then the main tag 'sweet and simple' was used for a layout title. 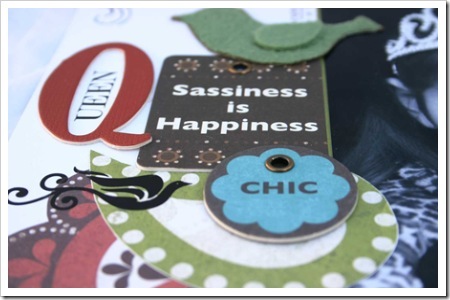 One of the smaller tags in the pack was then trimmed down considerably to create a mini accent for the layout in the top left hand corner (pure joy). 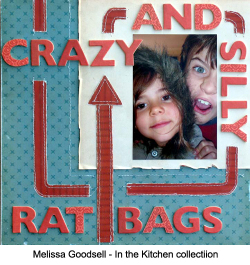 For this layout Mel has used one of the Hippo Tag-Line tags as her main heading, adding some extra alphabet stickers to create a larger title (your favourite things about Qld). The tag has also been used as a prompt for Mel's journaling - fabulous for those left over photos when you can't quite think of a title for the photo/s, simply grab your pack of Tag-Lines and away you go! Donna was taken with W R memory Keeper's Nettie Tag Lines - the bold colours and bold fonts make them perfect as a title or part-of. 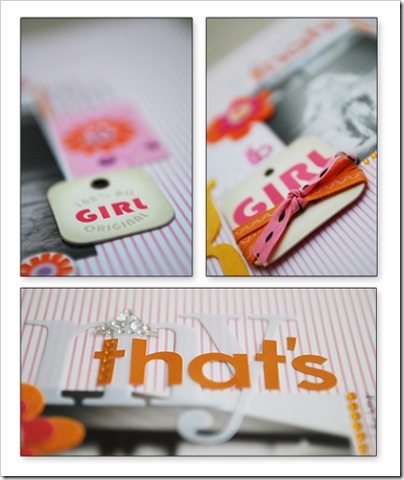 To make the large 'girlfriend' tag work for her and fit her title, Donna covered the word "friend" with ribbon leaving her with the title she had originally envisioned - 'that's my GIRL'. In keeping with the tag 'theme' Donna also incorporated SEI's new Ally's Wonderland tags. The two ranges are a perfect fit and compliment each other brilliantly. 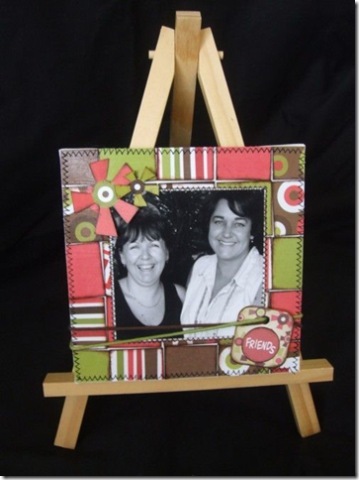 Chris created this beuatiful little mini canvas for her friend Leisa using the We R Memory Keepers Nettie range. 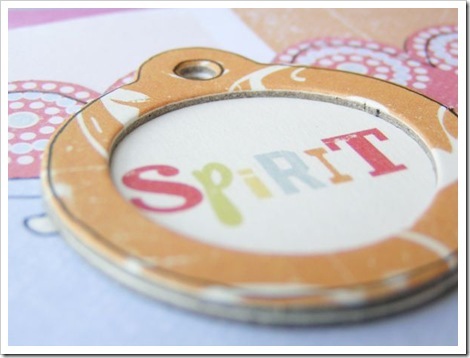 She tied the Nettie tag across the front of the canvas for a simple embellishment. It doesn't have to be time consuming to be effective and products such as these Taglines can help make life (or handmade gifts) quick and simple. 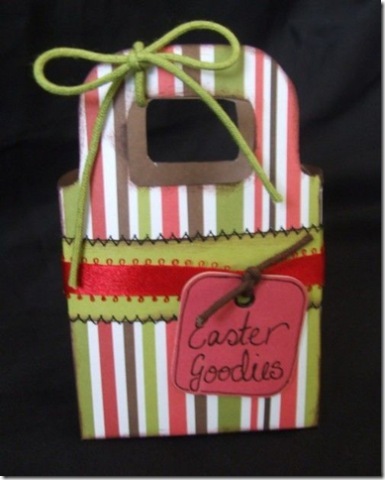 Here Chris created this Easter Goodies bag from the Nettie range of papers and wrote on the tag to describe the purpose of the goodie bag. 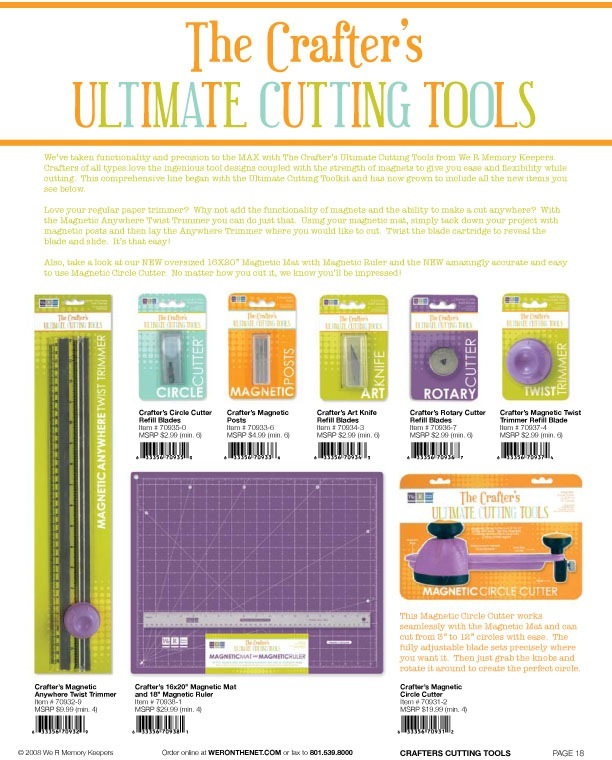 Then again, if you enjoy a time consuming project, see Suz here! 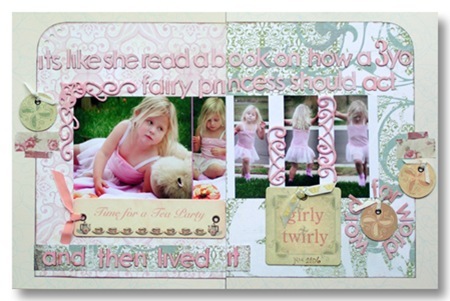 This double layout is packed with detail, but the We R Memory Keepers Fairy Tales Taglines form the backbone of the layout. They were perfect for these gorgeous photos of Phoebe who really does, unprompted, change into a tutu and prepare herself a teddy bears picnic on the front lawn, although Suz admits she might have had some help with the fruit salad. 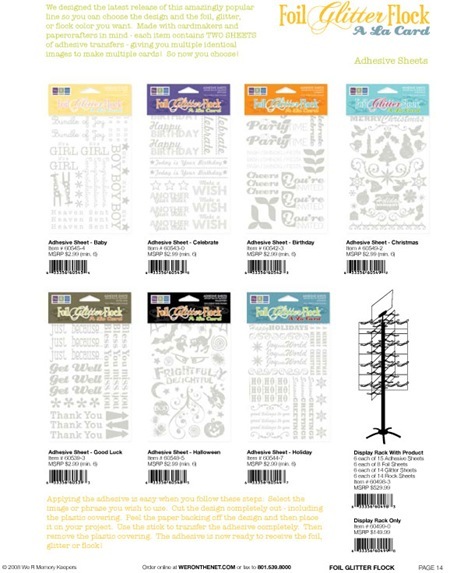 Because the Taglines are double sided they give you plenty of options, with well chosen words or phrases on one side and co-ordinating patterns on the other. Suz gave hers a subtle glitter treatment with Lil Davis Glitter Glaze as an accent on elements of the Taglines, as well as painting and covering Lil Davis chipboard and cherryArte alphas. SEI Morning Meadow co-ordinated beautifully with the three different BasicGrey patterned paper lines Suz combined as well as the subtle Luxe Designs Cashmere Sweater papers used as the background cardstock. 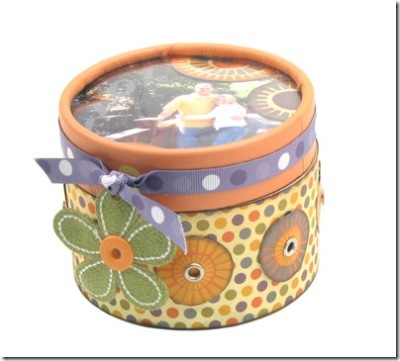 A touch of Heidi Swapp Decorative Tape joining the two ranges provided the perfect shabby finishing touch. 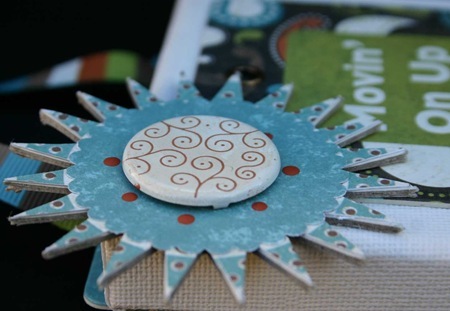 For the next few weeks we'll be sharing the results of our latest design team challenge using the fabulously cool chipboard tags by We R Memory Keepers. 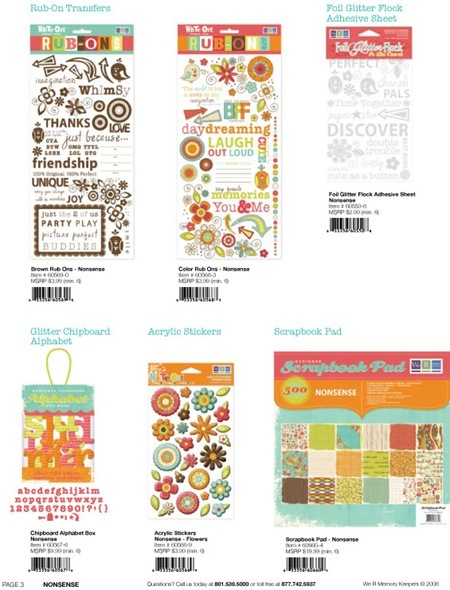 Some of them co-ordinate with their patterned paper lines, others are themed and work with lots of other papers of choice, all of them have versatile words and phrases that go beyond the usual cliches. 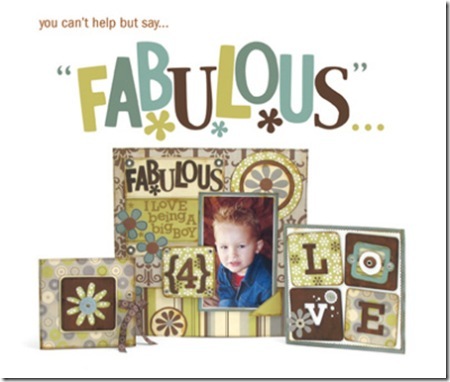 The talented Maxine just had so much fun with her Boho Chic pack so we start with her amazing work. 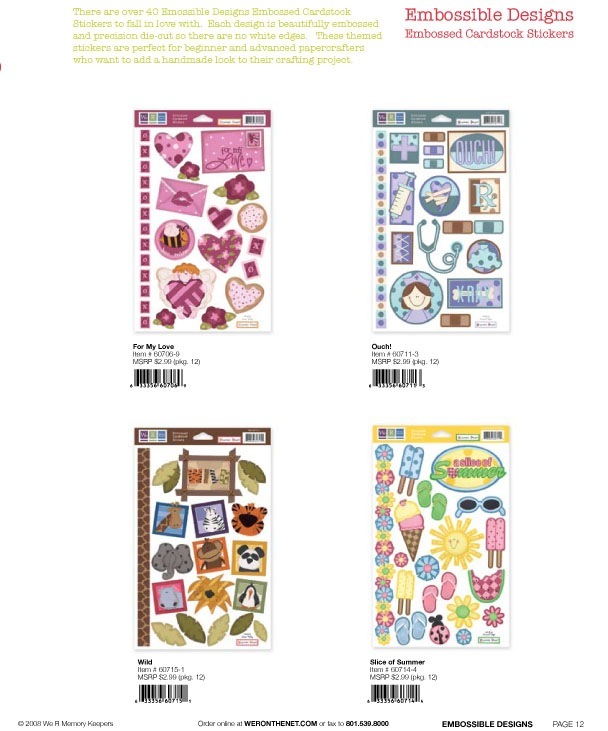 The Boho Chic taglines are quite varied in topics so rather than use them all on the one layout Maxine chose to give them all pride of place on her creations. She just kept on creating with them ending up with these three wonderful projects. 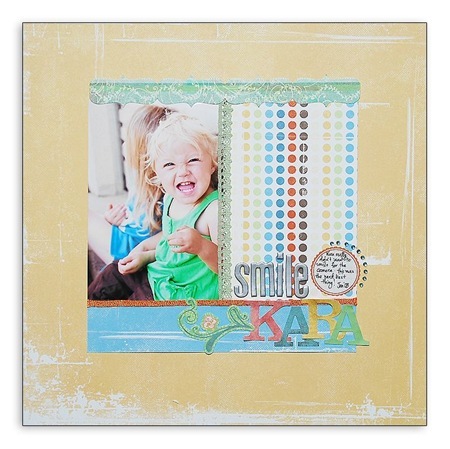 In this her first layout she used a combination of the Boho Chic and Homemade patterned papers. Still in keeping with the We R Memory Keepers range, she added some Precious Metals Silver lining rub-ons and Boho Chic alphabet. 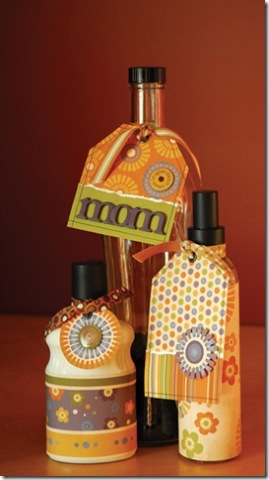 For some finishing touches she used Hambly & Basic Grey rub-ons and splashes of Heidi Swapp Icee Jewels. Keeping the same range of papers Maxine overlapped not only her patterned papers but also the Boho Chic tags. A touch of Basic Grey, Hambly and Crate Paper rub-ons and it all falls together into one stylish layout. Changing the photographs to black & white Maxine was able still have them prominent in the layout. Maxine created this hanging canvas as a gift for a friend who is moving house. 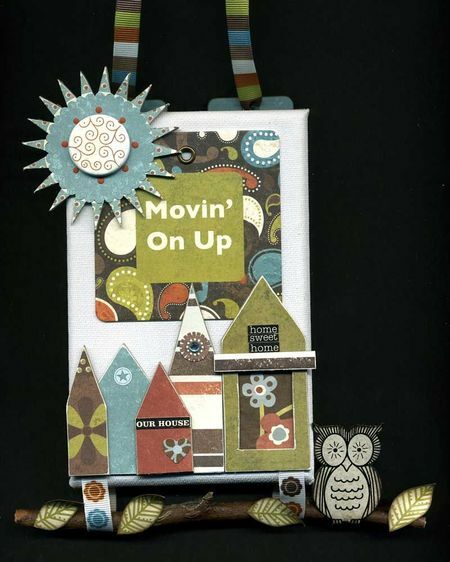 The Movin' On Up is the perfect tagline, especially considering her friend is moving into a double story home. She cut one of the tags in half and used each half to hang the canvas. She threaded the ribbon through the eyelets, because they are so strong and re-inforced with an eyelet they are perfect for such a purpose. 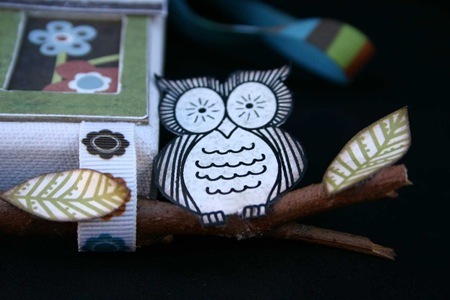 Don't you just love the owl sitting on the twig with the patterned paper leaves. Maxine rubbed the owl onto the reverse side of one of the patterned papers and cut around it, she then stuck it on the end of the twig. 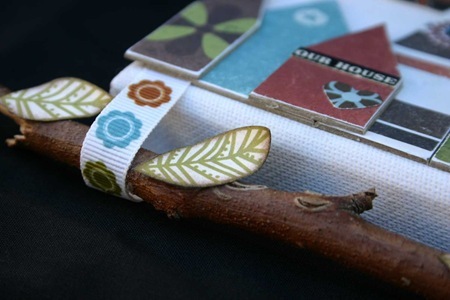 For the leaves she cut them out of a Scenic Route piece of paper, curled the ends and attached them to the twig also. The sun is from the cherryArte chipboard labels sheet which has been covered in We R Memory Keepers patterned paper with a Queen & Co Bold Round Brad and some dots of paint to finish it off. Such a funky project to hang up in her friend's new home. 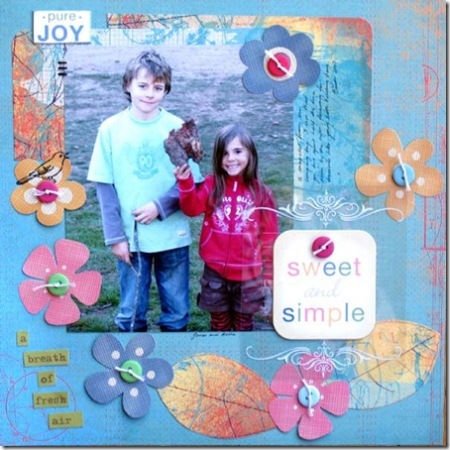 Now a wonderful idea from Jaimie Emmerton, by layering the We R Memory Keepers Tuscan Meadow tag lines on her page, Jaimie embellished this LO to give plenty of depth and texture. 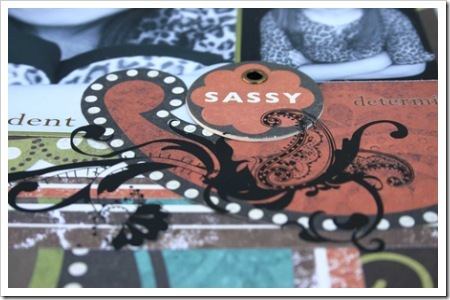 The quotes on the tags made a perfect title and with the addition of other simple embellishments such as rubons, journaling spots and stamps finishes off this page and showcases this stunning photo perfectly. 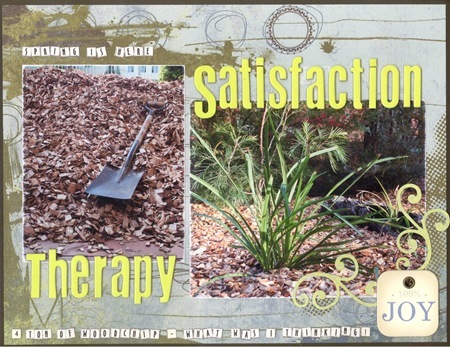 Caz has used one of the taglines on this page about her latest delivery of woodchip. She found the shoveling and wheeling great therapy to take her mind off arguing children and scrappers block. And even though all he muscles ached, the end results were so satisfying. Caz covered some of the Sunshine taglines in cold laminate. 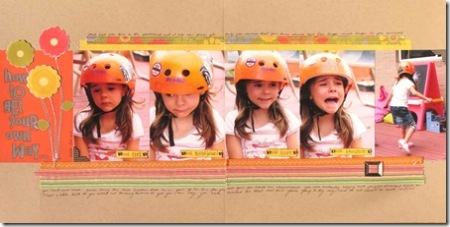 She then mounted a photo of her daughter and her friends on 2 different coloured cardstocks and laminated this as well. 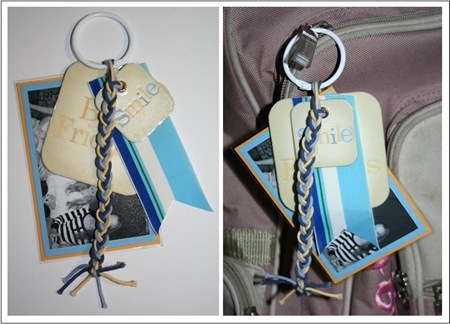 Caz applied ribbon-stiff to a strip of matching strano ribbon to protect it from fraying and tied the whole lot together with a plaited length of the cord that comes with the taglines to make this funky school bag tag. Check back next week to see even more fabulous ideas for using these Taglines from the design team. 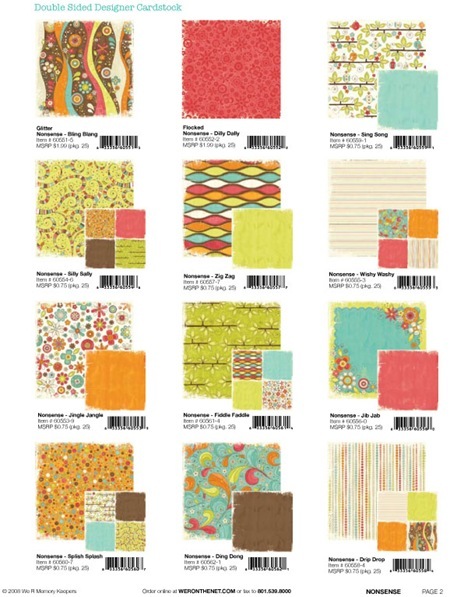 there's always more from we r memory keepers, but here's a glimpse at their new Promenade line. We R Memory Keepers 'Precious Metals' lines of patterned paper are like nothing else on the market at the moment. The soft yet strong colours are not only appealing and versatile but importantly they can happily take a back seat, allowing your photos to remain the focus. Not just that though, but these superb quality papers have actual metallic shots running through the patterns, subtle and elusive to photograph, but in real life providing a soft gleam when the paper catches the light on certain angles. 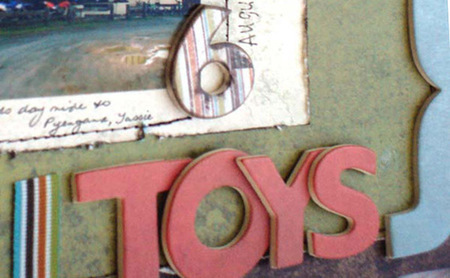 We have a heap of stunning examples in this post from our Design Team, from We R Memory Keepers Design Team and from around the scrapping world to share. Enjoy. Aussie Scrap Source's black cardstock is the perfect backdrop for the bright colours in the Silver Lining papers. Maxine used the swirl rub-ons behind the Jenni Bowlin bird and on its wing. She added doodles on top of the bird rub-ons for additional decoration. The Queen & Co large brads make the perfect flower centre, adding dimension to any layout. For this double layout, Mel has drawn around the edge of Silver Lining rubon letters using a black pen to make the title stand out just that little bit more. The flower tops have been hand cut from Silver Lining Brilliance patterned paper and the stems simply machine stitched into position. The Silver Lining Metal Hardware (brads, photo corners and buckle) were added to finish off the layout nicely. 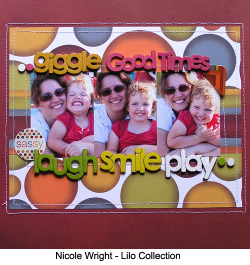 A quick and easy way to complete a double page layout. Shades of pink don't always have to be for girly pages! 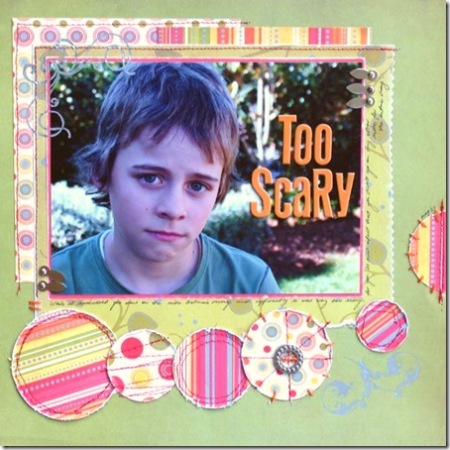 Mel has had fun creating distressed circles with a splash of stitching to convey a happy and upfting layout that has turned out completely the opposite to her title 'Too scary'. A mix of Silver Lining Metal Hardware and rubons have finished off the page beautifully. 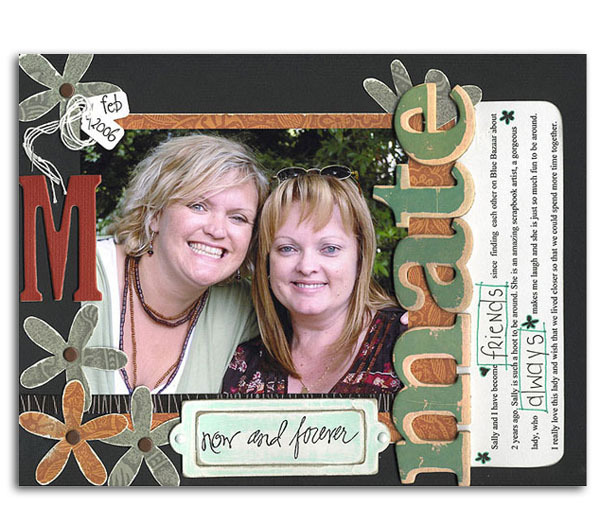 We fell in love with this layout created by the talented Aussie scrapbooker, Cathy Bodini. 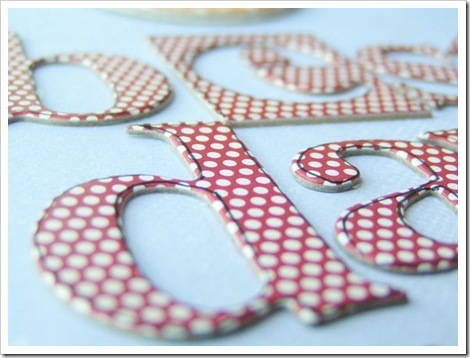 Cathy has covered chipboard letters using the Silver Lining patterned papers and used dimensional magic over the top for a nice glossy finish. 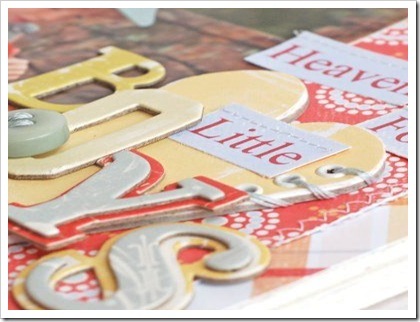 She has combined the metal hardware and alphabet rubons from the range perfectly to complete the layout. Such a sweet layout by Cindy Tobey. 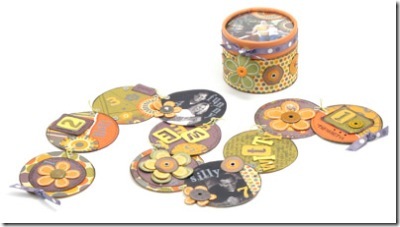 Here's what Cindy had to say about the gorgeous We R Memory Keepers' new metal range on her layout - "Okay, I have to say I LOVE We R's new metal products...Yum! Used one of their metal alphas, metal rub ons, metallic ribbon and paper". We have to agree with Cindy here, they are seriously yum! 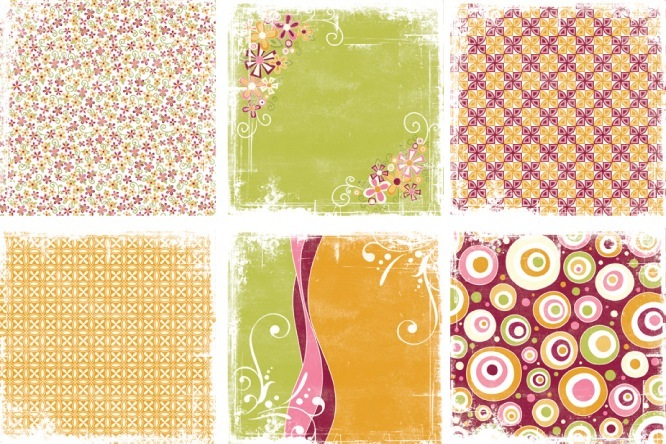 Thanks for sharing your layout Cindy. 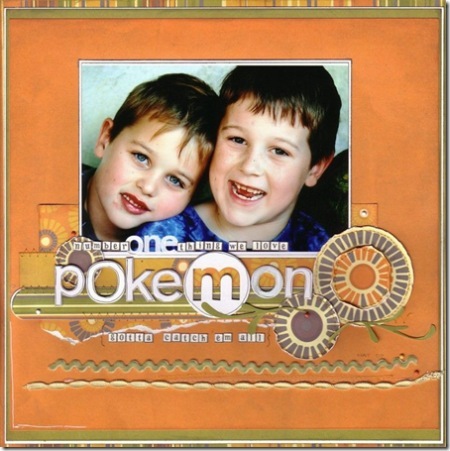 The WeRMemoryKeepers Pewter Press range is the perfect colours to comliment this photo Nic Howard has of her sons. 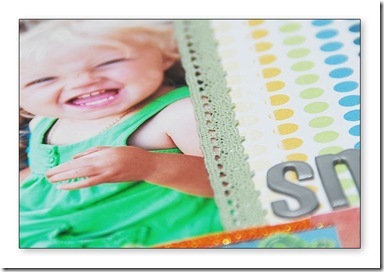 The bright papers contrast with the colours in her photo with subtle patterns just to add a point of difference. 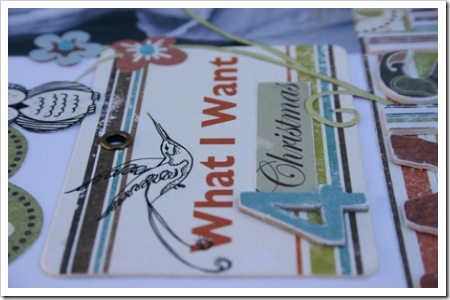 Nic curled the edges of some of the circles, she added mini sprinkles, heidi swapp lettering and some Basicgrey ribbon to finish the layout nicely. 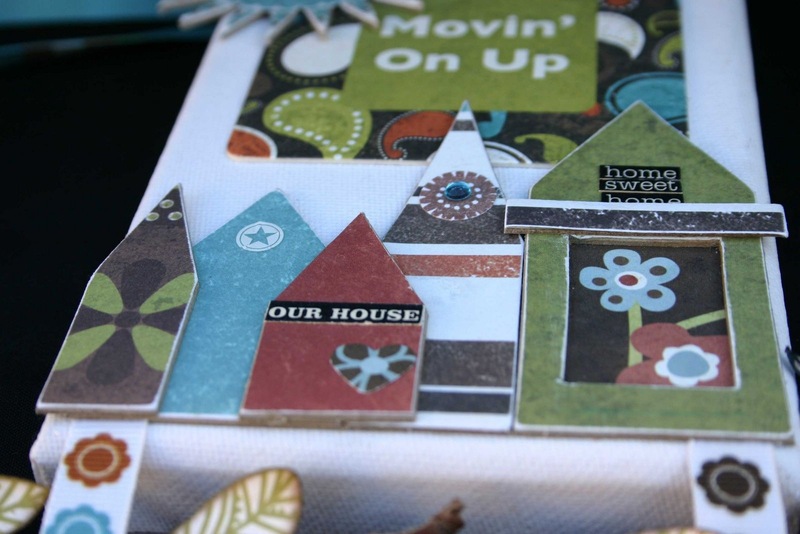 This funky project not only makes great use of the Pewter Press papers and embellishments, but you can recreate it yourself with this step by step instruction download from We R Memory Keepers. How cool is that? 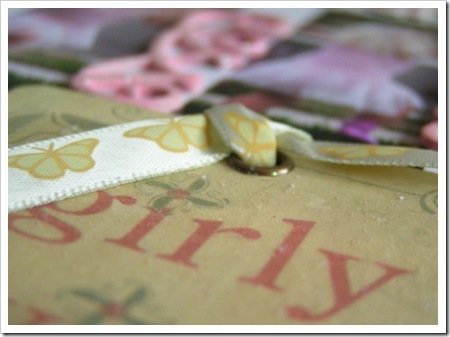 Two gorgeous layouts and cute tags and wrappers with thanks to the We R Memory Keepers Design Team. 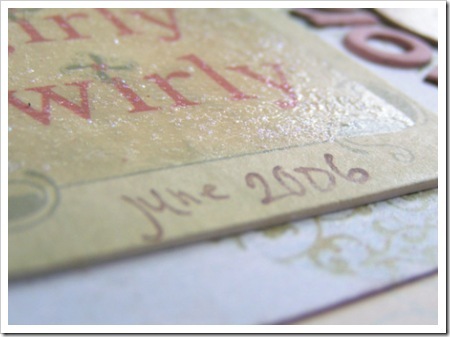 The We R Memory Keepers 'Coppered Out' range is just stunning. Jaimie kept it to a minimum with a cluster of paper and embellishments that sets off the photo of her cousin and his wife. The less is more approach works perfectly on this page. You actually can't help but say 'fabulous' at these projects. 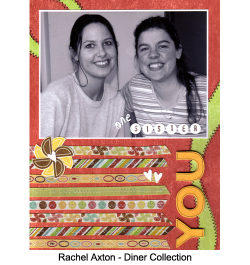 We thank the We R Memory Keepers Design Team for letting us share them with you. 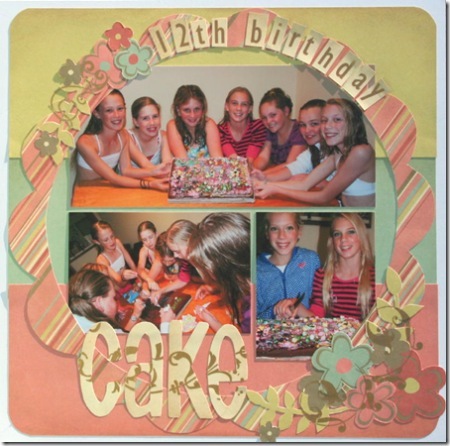 The gorgeous colours in the Vinatge Brass papers were perfect for these fun photos of Caz's Daughter and her friends decorating her birthday cake. 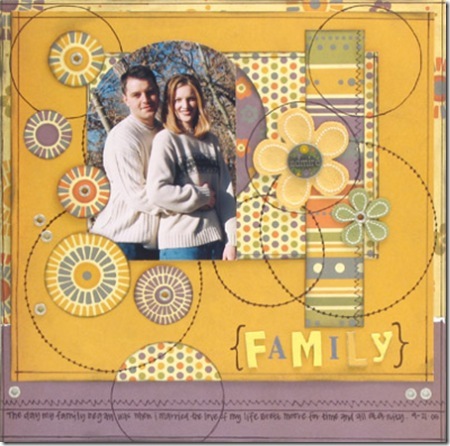 As the photos are quite busy Caz used the plain side of the papers for the background and handcut a large flower shape from the striped paper and some of them small flowers from the floral paper. 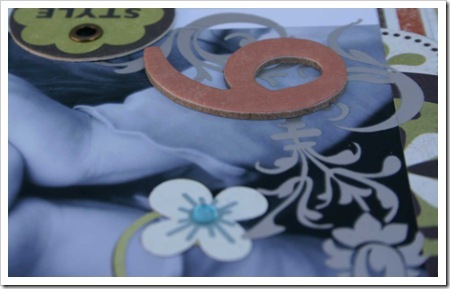 She arranged them around the photos and added some beautiful Vintage Brass rub-on swirls. 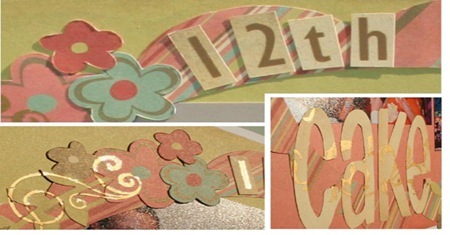 The smaller title letters are Chi Chi Vintage Brass rub-on alphas. 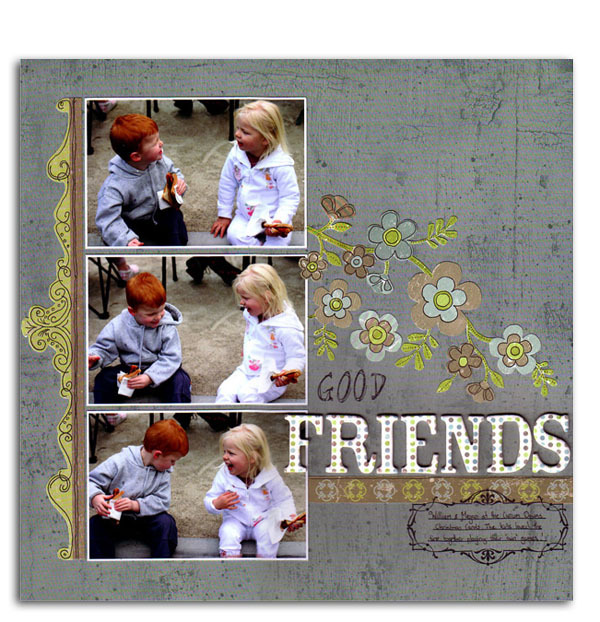 Another two wonderful soft layouts making good use of the slightly whimsical Vintage Brass papers from the We R Memory Keepers Design Team. This layout by the very talented Lisa Garay deservedly jumped out at us, not only because of the stunning photos but because of the gorgeous colour combination. What's particularly exciting about this layout that you may not notice at first glance is that Lisa has used patterned papers from all four of the Precious Metal ranges, showing that although there are four very disparate colour stories, they can also be mixed and matched for a fabulous effect. Notice also the eyelet detail along the torn and folded paper and the brads decorating the felt flower. 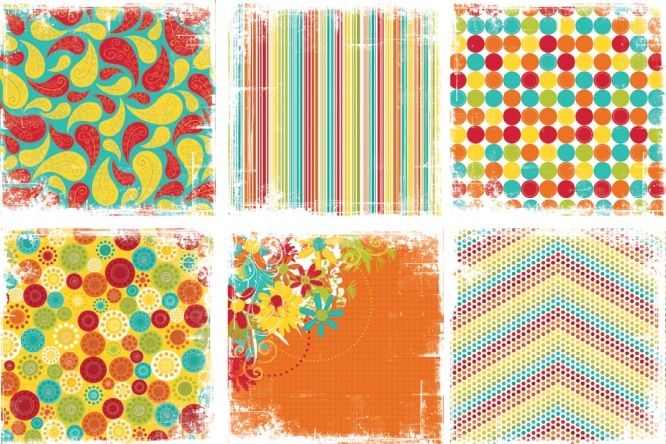 Finally, we loved these layouts by Stephanie Gianniny because of the beautiful simplicity of them. 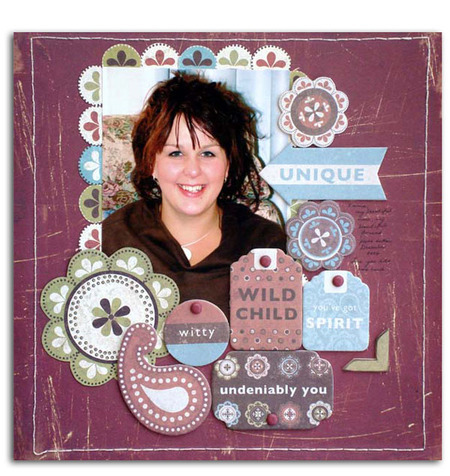 The designs she has used keeps the photos as the focal point of the layouts while the patterned papers and embellishments from We R Memory Keepers 'On the Dot' and 'Boho Chic' ranges simply enhances them. 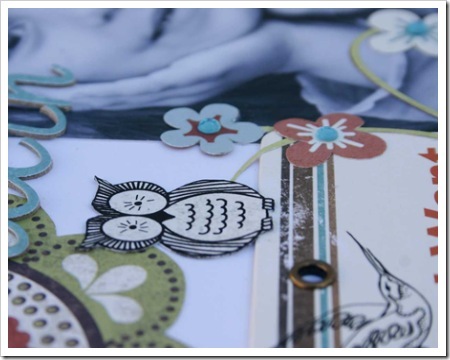 This weekend we share some inspiration using the beautiful naturals of the We R Memory Keepers Comstock Collections. 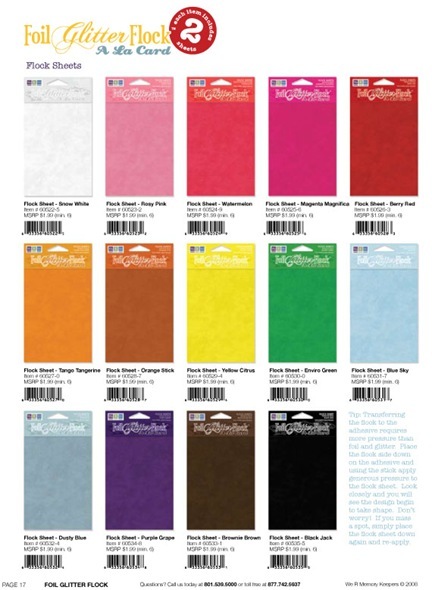 The Comstock range of papers offer an earthy feel that are suitable for a variety pages. 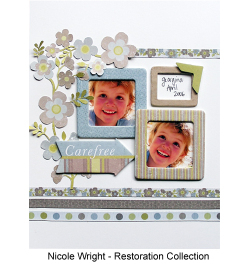 Masculine, vintage and nature pages are the first that come to mind, but here Nic shows us that they suit girlie pages wonderfully too. Featured here are the Comstock Kitchen papers and ribbons. 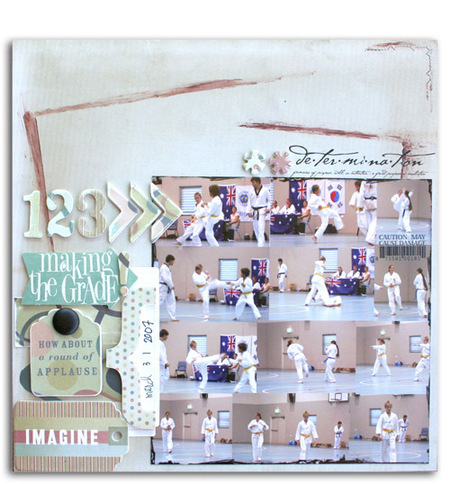 The subtle Comstock Circus range of paper fit perfectly with the collaged photos of Jaimie and her sons recent Tae Kwon Do grading. 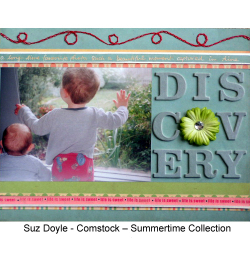 Wanting to keep the focus on her photos she layered accents from the Comstock goodie box over distressed strips of paper from this range which kept the page uncluttered. Rubons from Heidi Swapp and Basic Grey complete the title. 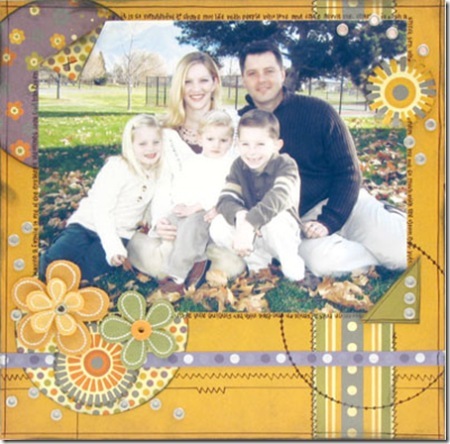 Mel's daughter Bella has a little Indian costume that she loves to dress up in and when these photos were developed Mel knew that they would work perfectly with the the Comstock Garden Path collection of papers, alphabets and embellished tags. Pinking shear scissors were used to create a jagged look on the papers and photo, which ties in with the costume edging. 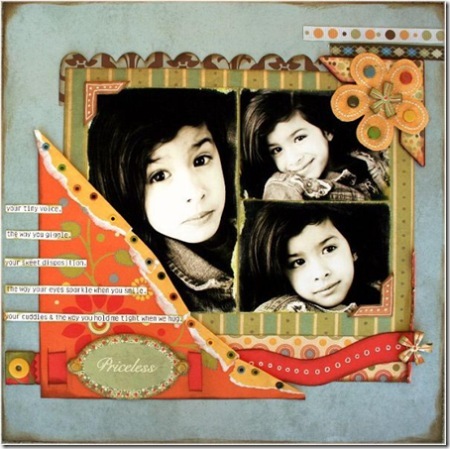 How sweet is this layout by Kristy Lee!? 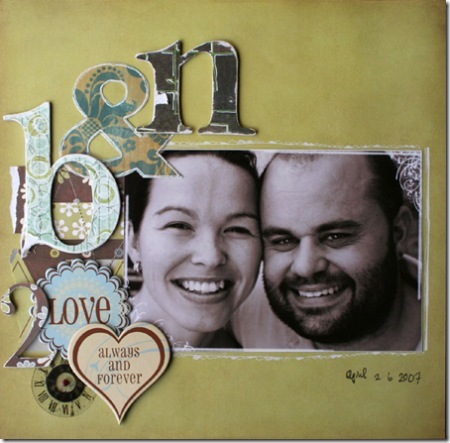 We loved the large main photograph (what a beautiful couple) and the hand cut title works so well with the Garden Path chipboard letters. 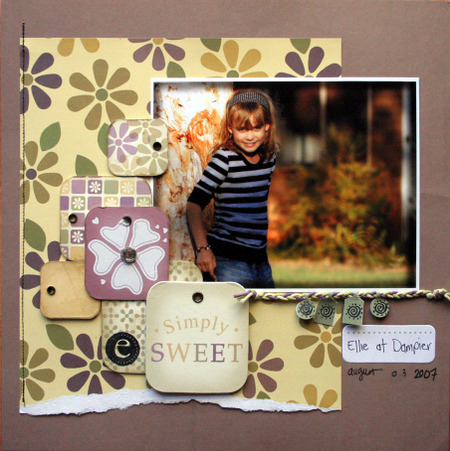 The soft muted tones work wonderfully with the scattering of smaller photos on the left hand side of this double page spread. 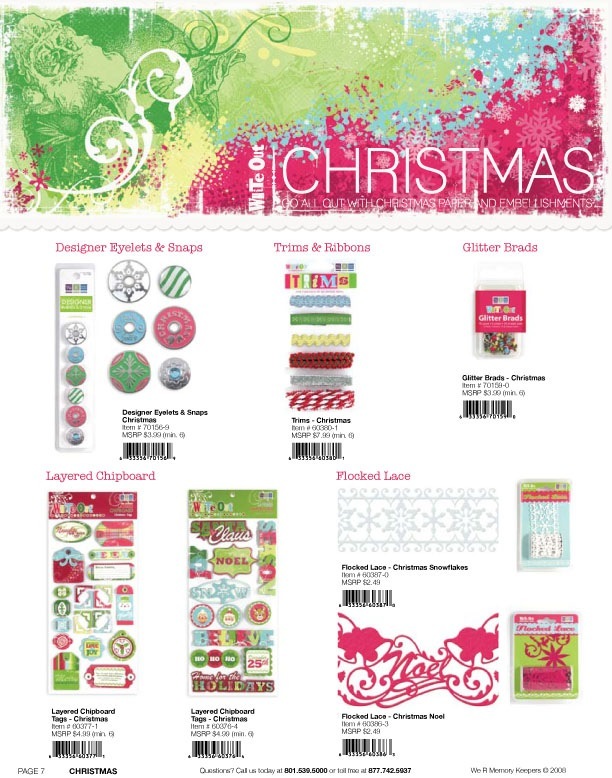 Thankyou Kristy for sharing your layout with us. AND.. we share a challenge! Remember these from We R Memory Keepers in our Winter CHA Previews? They've arrived! The images don't do the papers justice - they have stunning metallic highlights running through the patterns, and range from beautiful muted colours perfect for winter through to the warmth and brights of the silver range. 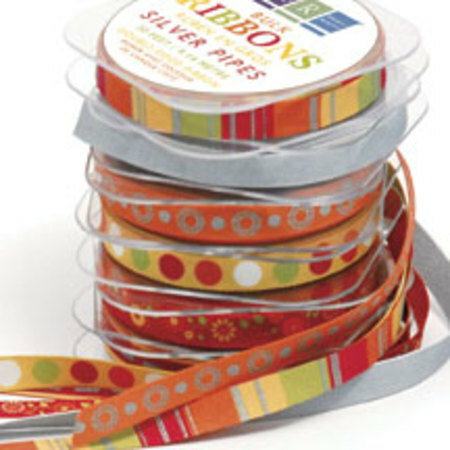 The rubons have a metallic sheen and are gorgeously easy to apply - even the ribbons metallic accents. The design team have been awaiting their arrival eagerly, and we'll be showcasing their creations in a few weeks. As you know we love to share not just our own design teams work but also layouts that we love from around the online community. If you have created with these papers already, or if you are looking for an excuse to(! ), we'd love to see them, and share a limited number in our blog post. 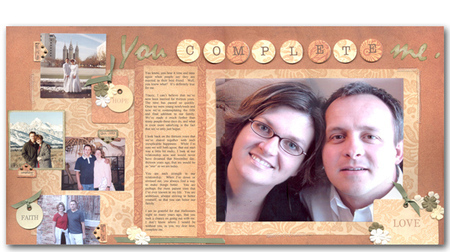 Email us if you have a layout using We R Memory Keepers Precious Metals if you'd like us to share it. 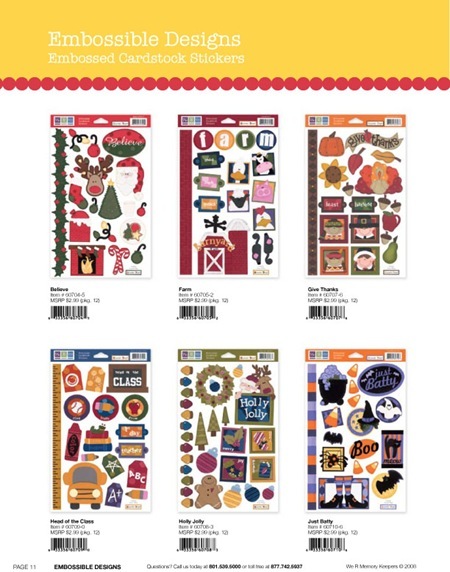 And if you can't find the papers in your local scrapbooking store yet, ask them to order them in for you! It's Friday again. 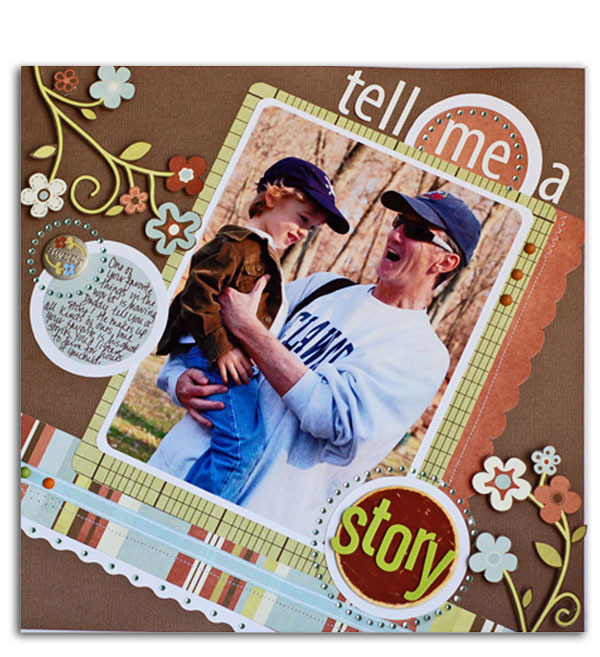 This week we leave you with some gorgeous layouts using the We R Memory Keepers papers and emblishment. I think you will agree this range is stunning!